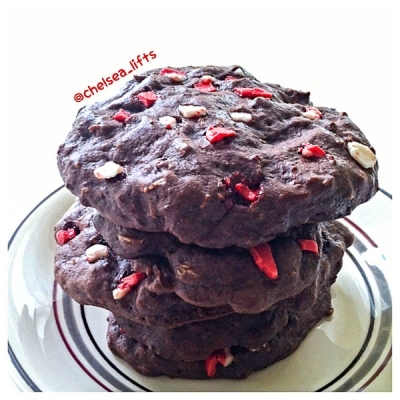 Deliciously light and fluffy Chocolate Mint flavored cookies filled with protein and topped with peppermint bark chips. Mix all ingredients in a mixing bowl until everything is combined together and the mix forms a dough-like consistency. Spoon balls of dough onto a cookie sheet into five equal balls. Space balls about two-three inches apart. Once all balls are on the cooking sheet, flatten slightly in order to create a circular cookie-shape. Cook for Seven minutes (325F in toaster oven, 350F in regular conventional oven). Once cooked, remove from cookie sheet and let cool on a cooling-rack.